The high temperatures at the TT Circuit Assen today matched the hot action in the final stages of today’s Q2 session. With many riders waiting to make a move until the last minute, the outcome of the qualifying was anybody’s guess. 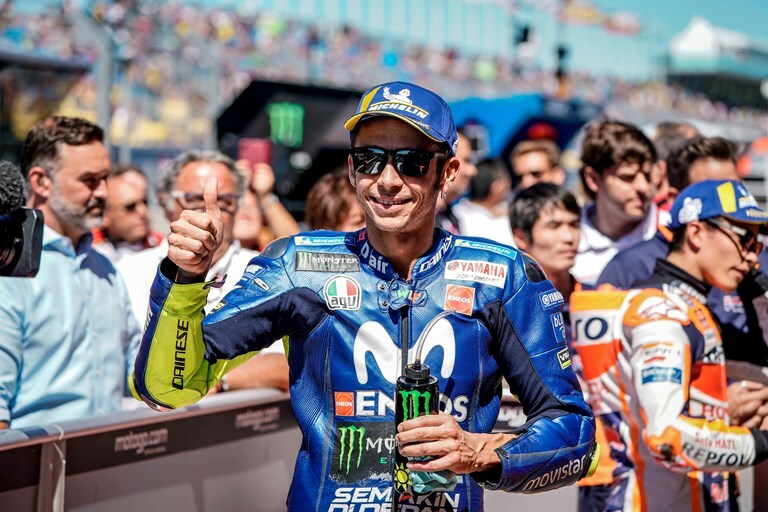 Movistar Yamaha MotoGP’s Valentino Rossi and Maverick Viñales rode on the limit on their last flying lap and secured third and sixth place respectively. Rossi had more than one mission during today’s Q2 session. Having suffered a fast crash in FP4, he used his first run to complete three laps to get back into the groove and recover his feeling with the bike, before putting his head down during his second stint. Leaving the garage with four and a half minutes left of the session, the Doctor found himself in tenth position and had time for two attempts to better his ranking. He left it late but found a good spot on the track for his final try and clocked a 1’32.850s, just 0.059s from pole, to take third place, on the front row. Similar to his teammate, Viñales delayed his start in the hope of finding some clear space on track. His first hot lap put him in fourth place, but he dropped down the order as the pace quickened. Unable to improve his time on his next try, he dug deeper and posted a 1’33.557s that put him in fifth place, before heading back into the pits with six minutes remaining. He hurried out of pit lane one and a half minutes later eager to give the time attack another go, but the level of competition proved to be fierce. Multiple riders set red sectors in the final minute of the session and dropped below the 1’33 mark. The Spaniard was one of them and posted a 1’32.984s final lap, earning him sixth place, 0.193s from first. Monster Yamaha Tech3 star Johann Zarco showed a fantastic effort this afternoon at the TT Circuit in Assen. During his first Q1 session of the year, the fast Frenchman snatched the top position last second and did an excellent 1’33.072 in Q2, which made him miss out on the pole position by just 0.281 seconds, starting the Dutch GP on Sunday from the middle of the third row. Yet, Hafizh Syahrin was leading the Q1 session after his first flying lap but was unable to improve on his fast lap time as he run into traffic on track. Thereby, the Malaysian rookie missed out on his first second Qualifying of the ultra-competitive premier class field by only 0.066 seconds. Syahrin lowered his fastest lap from Friday morning by incredible 2.172 seconds and is set to attack from P15 on the grid for tomorrow’s 26 laps race at 14.00 local time.